You will see the information on your display while people on either side only see a darkened screen. It is important to note the size of privacy filter will need to be the same width and height as your laptop screen or LCD monitor. Search online for same brand and model number of your monitor to find the screen size or measure the height and width of your screen. 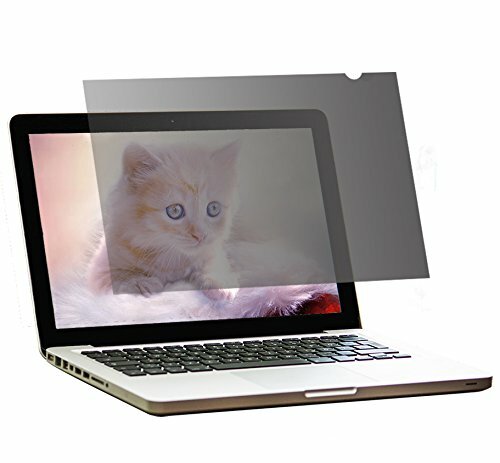 Do not include frame size, only the viewable area is correct size of privacy screen filter you need. Micro-louver layer of fine blind method controls viewing angle so that it can protect user privacy by showing the real screen at the front, but the black screen at the side. Micro-louver improves the quality of picture to control over-brightness of light and optimize where light proceed. It also makes less eye-strain by preventing visible reflection. It is useful of good health by minimizing the blue light which can cause dry eye and insomnia. It keeps the screen clean to stop the propagation of bacteria that is parasites on its surface. It blocks the external light entering the screen from a random direction and enhances the effect of light and shade contrast by making straight rays that are generated by the screen. It provides excellent surface smoothness unlike some other existing films. 15.6 inches Widescreen, Filter size(WxH) = 13.6"x7.6" (345x194mm), 16:9 aspect ratio, "Check your screen size before purchasing!" If you have any questions about this product by VUMAIN, contact us by completing and submitting the form below. If you are looking for a specif part number, please include it with your message.